Each student presented and read their StoryJumper story to the class. Tuesday was our last full day of school, so that was the day for the kids to present and read their StoryJumper stories to the class. I wrote about writing with StoryJumper in an earlier post. I wasn’t sure how this was going to turn out. Everyone had been very excited and interested in creating these books, but there was also a lot of talking, which isn’t surprising during the last three weeks of school. In fact, there was so much talking, that when I had checked on their progress about a week before, I was disappointed to see that most weren’t very far along. 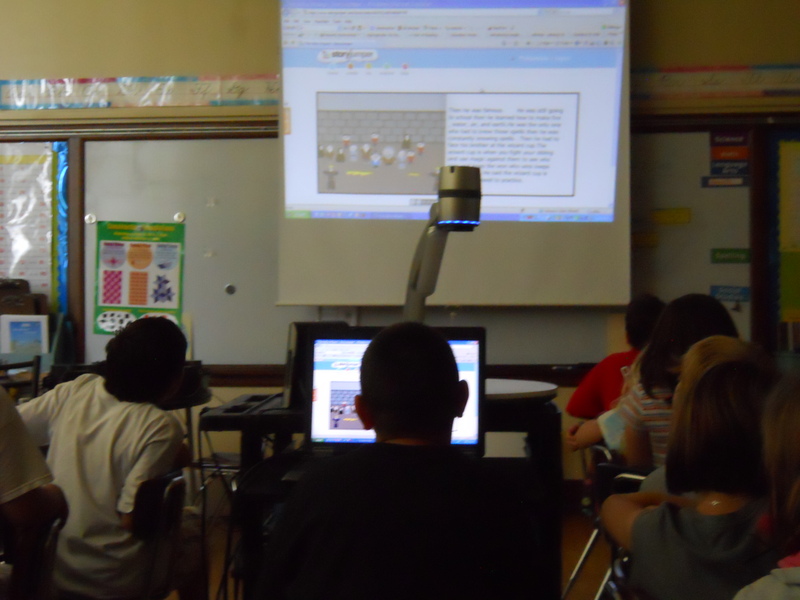 Each person presented and read their StoryJumper book out loud to the class using the digital presenter. By the time the first three kids had presented their book, I was on the phone calling my principal to see if she had time to come up to see what they had done. She is in our rooms frequently throughout the day, so she had been checking on their progress throughout the writing process. Many of the kids were not finished, which is okay, because they can continue working on their books during the summer. Even so, they had pages of writing, with illustrations to enhance their story. My little authors really knocked my socks off. Their stories were interesting, with good plot lines. In fact they were interesting enough to hold the attention of the class while all 24 people presented. Our Special Ed teacher, with whom I collaborate, pointed out that if we had asked the kids to write a five hundred word story, they would have had a fit, but that’s really what they did, and they had a ball doing it. We decided that next year we will devote some time to letting the class explore the mechanics of creating illustrations using the backgrounds and props, before they actually begin their books. Creating their illustrations took much longer than I anticipated. At the risk of thwarting their creativity, we may also talk about how to select backgrounds and font size so that the pages can be more easily read. I always do a lot of writing with my students, but this year we have definitely surpassed anything I have done before, and that is largely because of the technology that we have explored and utilized. We’ve written comments on our class wiki. We’ve used Wallwisher, Storybird, KidBlogs, and now StoryJumper. It has particularly made a difference for my struggling writers. Using the computer removes any roadblocks caused by the physical act of writing. It also makes reading their work so much easier. This was apparent when every single student, including those with writing IEPs were able to read their StoryJumper book aloud to the class. Is their writing perfect? Is every sentence capitalized and punctuated correctly? Are all words spelled right? No. But they are writing, and I couldn’t be more please with their progress. We are definitely going to do this and more next year. 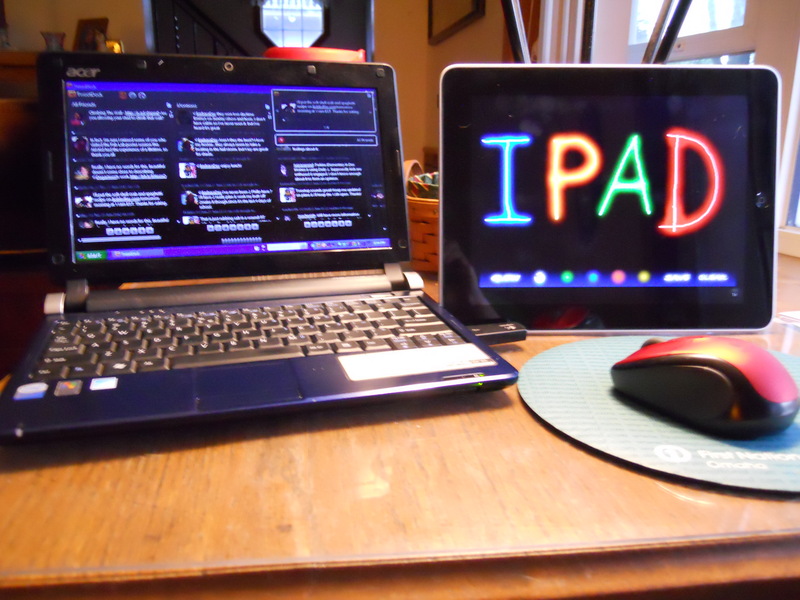 I will be introducing blogging and digital story writing much earlier in the school year. Imagine what we can accomplish if we have all year to explore and grow! It is the last week of school, and this is a great time for reflecting on and evaluating the new things I have tried in my fourth grade classroom this year . It is also a time for making plans for next year. I am amazed by how much my teaching and personal life have been transformed by my venture into using technology in my classroom. 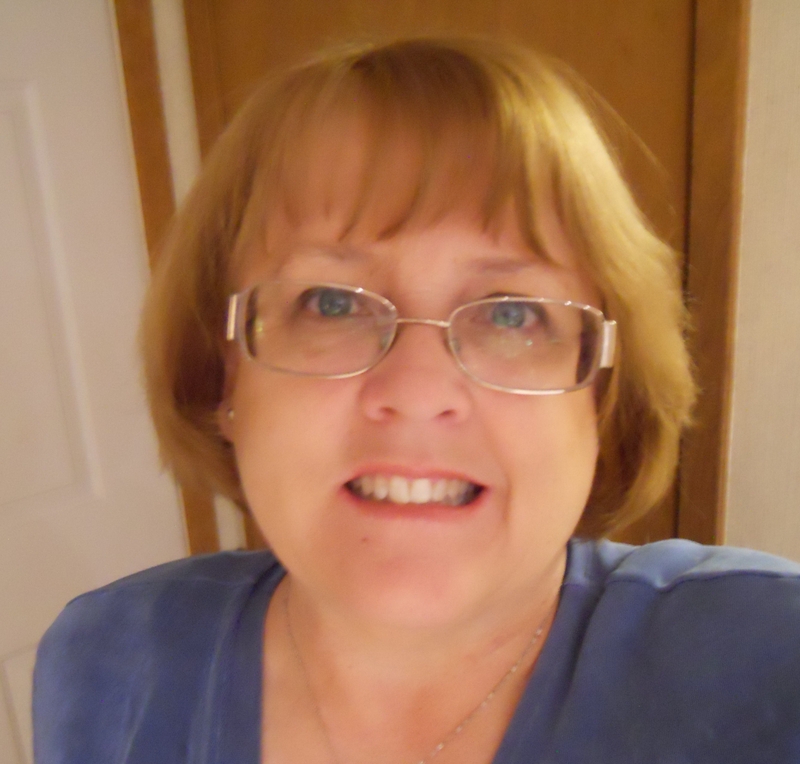 It all started last summer with an on-line technology class, Using the Internet in the Classroom, and has continued throughout the year with my continuing professional development via Twitter. At the beginning of the year I was trying something new almost every week, to the point of exhaustion. Since January I have continued to explore new resources and new ideas, but at a slightly slower pace. By far the best thing we have done this year is the blogging, which is interesting since that is where I began. The way I’m utilizing blogs has changed greatly since last April when I set up my classroom blog, Ms. Day’s Fourth Grade. Our very first blog post was last May, following our annual field trip to Living History Farms. Keep in mind that prior to that, I did not know what a blog was, and I wasn’t exactly sure how to approach classroom blogging, but my goal has always been to keep the kids writing. I started out by writing a question and having the kids respond through a comment. This worked ok, but it didn’t keep my students’ writing at the forefront, and they had little flexibility in deciding what to write and therefore, little ownership. At the beginning of second semester, I began having the kids write as the “Guest Blogger” on our class blog. We were working on opinion pieces so they were to write on a topic they felt strongly about. This worked for some kids, but not for others. Then I learned about Kidblog.org and after spring break, every child began to have their own personal blog. I have seen real improvement in their writing since we began this latest venture. It has also been very gratifying to receive the feedback and support that we have, from their third grade teachers, parents, our principal, and members of my Twitter PLN. The kids have been excited about their blogs, but I was really hoping, that more kids would go on-line from home to write on their blogs, or that they would write additional posts when they had free time at the computer center. I have had only two students do that. I know how I feel about the things we have done, but I’m not always sure how the kids really feel, so I decided to have the class complete a survey about the technology we have used this year. I created it on a Googleform and embedded it in our ReadtheWeb Class Wiki. That is something else I learned this year, and I blogged about it in my post, Using Google Docs to Create and Embed an On-line Quiz. As I was getting ready to analyze the data, I clicked on summary, and accidentally learned it was already done for me. I often learn by hit or miss. I am so glad I decided to survey the class, because I have really enjoyed seeing what the kids have to say. 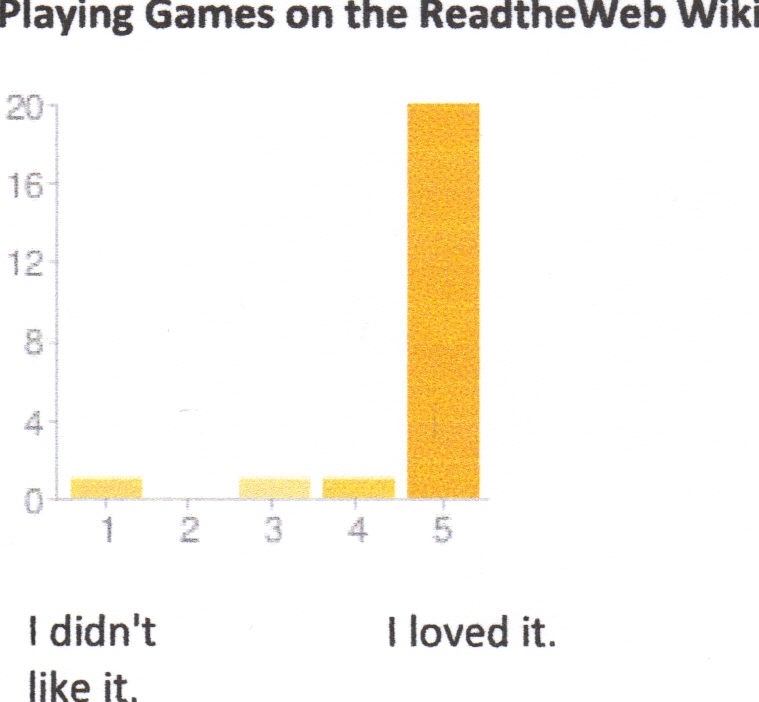 Students were asked to rate each website on a scale of 1 to 5, with 1=I didn't like it and 5=I loved it. They have really liked the Kidblogs, Storybird, and StoryJumper. When asked what was their favorite thing that we did involving technology this year, one student wrote, “I liked the StoryJumper the best, because I love to write and the StoryJumper brought out my best story yet.” How could a teacher not love a statement like that. No doubt about it, they love our class wiki with all the links to games and other resources. 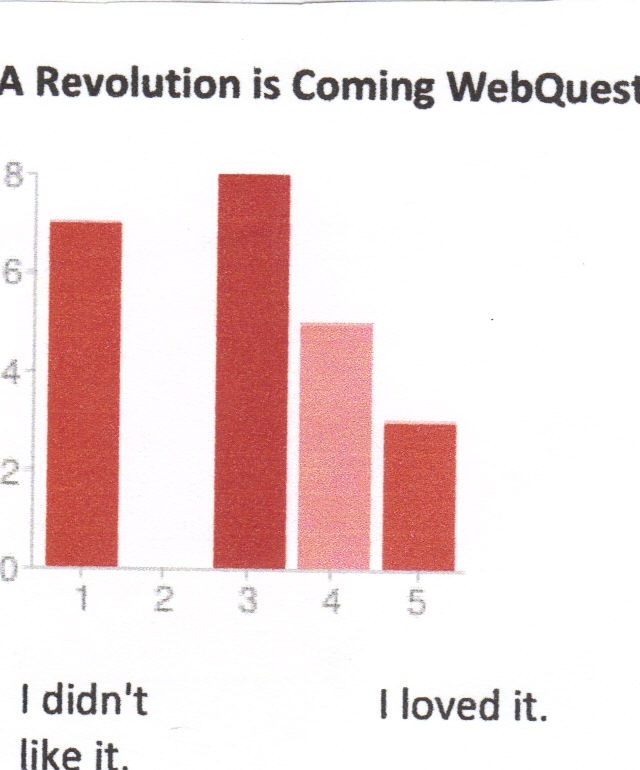 Our webquests were not nearly as popular. Not nearly as popular were the webquests we did. The kids have better memories of “Mountain Trek” which was our first technology experience, than they do of the American Revolution webquest. One of the things I liked about a webquest was that it controlled where the kids went on the internet. I felt that it kept them more accademically focused. I asked the kids if they felt 4th graders were old enough to do their own research and find their own websites, because this is a direction that I think I will be going next year. I am very interested in learning about Glogs, and having kids collaborate on Googledocs. I have seen examples of these from other teachers on Twitter, some from kids younger than mine. I am thinking about having kids take more control of their research. Next year I want to do more in the way of teaching actual computer skills; helping kids to learn how to use search engines, upload photos, and add links to their blog posts. I think all these things will make the things we do more personal and meaningful. I think their Kidblogs could become a personal portfolio for each student. It would be great to have kids present their work to parents at parent teacher conferences. Boy, isn’t that the truth! We have three aging Dell desktops, an ancient Dell laptop, and five — year old HP laptops for 24 kids. Next year I will have 29 students. I am concerned about how to make this work with five more kids. One of the laptops is designated for a special needs child who will be in 5th grade next year, so there will be one less computer. This cart of laptops is actually for the entire school, but they have been housed in my room most of the time, since only one other teacher has shown any interest in using technology. While I keep sharing the things I am learning with my colleagues, I also worry what will happen if anyone else on staff gets the technology bug. My school has just aquired ten new IPads. One of my projects this summer will be learning how to use them. We can have a lot of fun with those. But I’m wondering if any of the other teachers will be interested. It would be fun having someone to share ideas with face to face, but with such limited resources, it would be hard to do the things I have done this year if I had less access to the equipment. While equipment concerns are sometimes frustrating, I have learned that once you start on this technology trail, there’s no turning back. For me personally, incorporating these new ideas into my classroom has revitalized my teaching. I am excited about the things we are doing and learning, and I know I communicate that enthusiasm to my students. So many times this year I have begun lessons with the words “I want to show you something I just learned. It’s really cool . .” So no matter how many kids we have, and how little equipment, somehow I’ll make it work. There’s no stopping now!